When Nintendo unveiled Sushi Striker this time last year, I was certain it would be my cup of tea. I mean, it was a puzzler, it featured a selection of (cartoonishly) beefy dudes, and it was being made for the 3DS--if that's not the recipe for my kind of game, I don't know what is. My interest in Sushi Striker plummeted, however, after I played through the demo that hit the Switch eShop a couple of months ago. 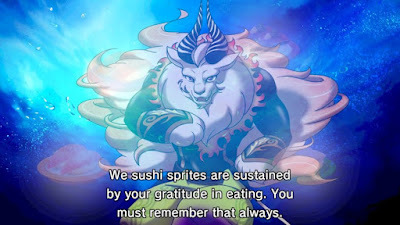 Not because I thought it sucked, mind you; in fact, I loved many aspects of it, including its colorful art, spirited soundtrack, and wacky (if sometimes longwinded) cutscenes. So what didn't I love about it? Its too-frantic gameplay. Although I've been a fan of puzzle games since I broke in my GameBoy with the freebie classic-to-be Tetris, I've never really enjoyed ones that demand Shazam-esque reflexes. I usually prefer puzzlers that allow players to contemplate their next move at least a little bit. As such, Sushi Striker and I got off on the wrong foot thanks to the at-first frenzied action at the heart of its demo. In fact, I grew so comfortable with it that I played Sushi Striker almost nonstop after it arrived on my doorstep. And not only that, but I played it right through to the end--a journey that took me just over 50 hours. 2. It's got a wonderfully goofy cast of characters--This is another reason I had a hard time hating Sushi Striker's seemingly endless cutscenes. Every one features at least a single character who gives new meaning to the word colorful. There's the brawny, tan, and tattooed General Kodiak, his pinheaded (but still impressively buff) minions, your hapless rival Kojiro, the "soosh"-loving hipster Rio (he even has the black-framed glasses to prove it), and a slew of others. All of them have personality to spare, so even if they start to get on your nerves a bit, you'll probably do as I did and continue to guiltily enjoy them rather than race ahead to your next skirmish. 3. The sushi-flinging action at its core eventually becomes deliriously instinctual--There's no question this game's sushi battles are frantic at the start. Everything moves so fast that early on you're more likely to find them frustrating than fun. Thankfully, those negative vibes slowly fade into the background after you successfully finish a handful of stages--or at least that was the case for me. By the time you advance to Sushi Striker's second or third area, you'll be wondering how you ever found it so overwhelming. At a certain point, you move your stylus (if you're playing the 3DS version) to match, stack, and toss sushi plates almost on instinct. That's when the game hits its stride and shows just how exhilarating it can be once you get the hang of it. 4. It's pretty deep, too--Not only is Sushi Striker's gameplay delightfully frenetic, it's also surprisingly deep. At first, it's difficult to think beyond matching like-colored plates from the four conveyor-belt lanes in front of you. 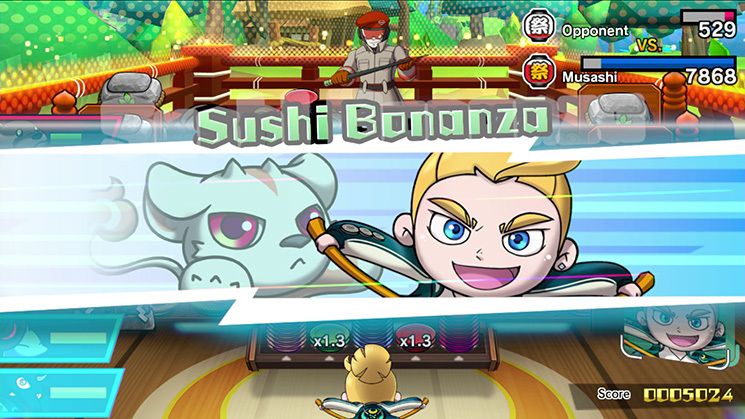 If you want to beat the best opponents in the game, though, or if you want to access its many hidden areas (most of which reward you with special "Sushi Sprite" companions when conquered), you have to bone up on things like the jubilee meter, the helpful skills provided by the aforementioned Sushi Sprites, the lane-drive gears that let you alter the speed of your conveyor belts, and more. 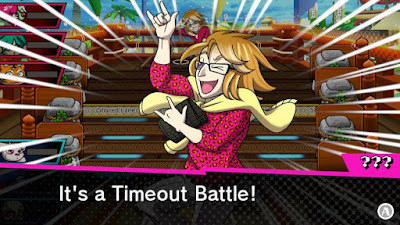 It's a lot to take in, admittedly, and the game doesn't do a great job of explaining most of it to you, but you've got to wrap your head around it if you're to have any hope of reaching Sushi Striker's credit roll. 5. The soundtrack complements all of the sushi-matching perfectly--That's not to say it sounds like something you'd hear in a sushi restaurant. It sure puts you in the mood to sling some plates of Japan's national dish (or maybe not) at the evildoers who get in your way, though. As you might expect, the tunes here are the definition of upbeat. However, they're not as syrupy sweet as most of the songs that support puzzlers these days. This is due, in large part, to the crunchy electric guitar riffs woven into nearly every track. 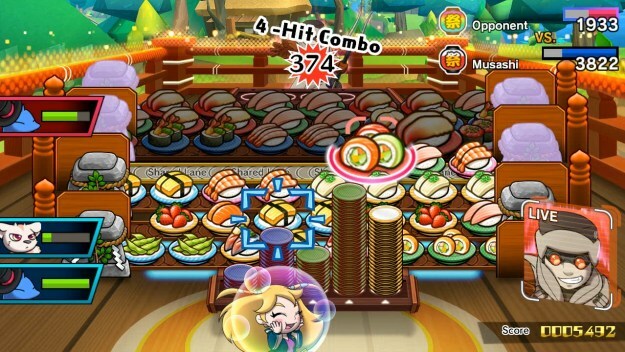 Combined with the plucky piano runs and techno-y blips and blops (technical terms, for the unaware) that pop up nearly as often, they make every Sushi Striker encounter a breathtaking blast. Have any of you played Sushi Striker? If so, what do you think of it? Share your thoughts in the comments section of this post.